The quality of accurate coding is critical in today’s health climate. Coding is utilized for appropriate patient treatment, reimbursement, research, the basis of financial and clinical decision making and worldwide comparative trending. As a result, the accuracy of reported codes must be audited and analyzed to ensure the data is relevant and clinically validated. Coding has many nuances: coding guidelines that must be adhered to, internal code capture for statistical purposes and incentive programs are just a few factors to consider in the coding arena. With so many factors at play, accuracy should be established on two levels. An audit with a random sampling of 2% of the required productivity standard per patient type by coder should be chosen. Those records should be reviewed for Diagnostic Related Group (DRG) accuracy and overall coding accuracy. DRG accuracy of 95% and overall coding accuracy of 90% are both essential. Overall coding accuracy takes into account elements more than the diagnosis and procedure codes. Both accuracy levels should be evaluated so appropriate feedback can be made to the coder. Refining the skills of the coder is the ultimate goal so the facility has clean data that will be above question and audit-proof. The overall coding accuracy should also be assessed for in-patient charts. This takes into consideration elements beyond code assignment such as present on admission indicators, discharge disposition, attending physician, operative date, operative physician and codes not affecting the DRG. It is calculated with a weighted scoring system. The audit accuracy is the average of the individual record accuracies. The out-patient coding arena is just as important. Overall outpatient coding accuracy takes into account all diagnosis and procedure codes plus appropriate modifiers. 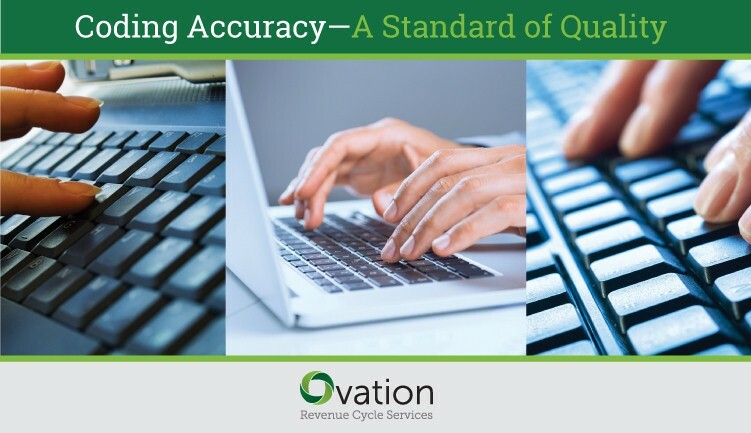 In summary, coding accuracy is an important part of the revenue cycle of health care facilities. Auditing can reveal areas that need a corrective action plan. Educating coders, physicians and clinicians will help strengthen the documentation needed to support code assignments. Monitoring the effectiveness of this education through follow-up reviews is essential to continued success.